Samsung’s Polish Facebook account has already all but confirmed the newest company milestone with 30 million Galaxy S III units sold since this past weekend since its unveiling back in May. Now, the company has issued a formal press release and some pretty interesting statistics showing just how fast sales of the Galaxy line has revved up since its first released. 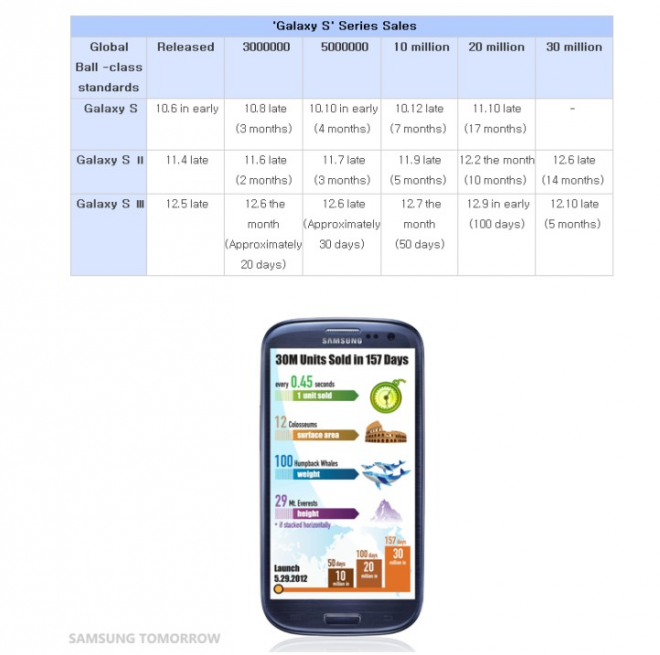 Samsung is selling a Galaxy S III smartphone at a rate of one every 0.45 seconds, at a rate of about 190,000 per day for the past 157 days. That’s compared to the Galaxy S which took 17 months to pass 20 million units sold and the Galaxy S II which took 14 months to reach the 30 million mark. The weight of 30 million Galaxy S III units equals 100 Humpback Whales, their surface area would fill 12 Colosseums, and when stacked on top of one another horizontally would reach as high as the peak of Mt Everest. So when someone questions how you calculate Samsung as the undisputed leader in the Android world, this is how we figure that. SEOUL, Korea – November 4, 2012 – Samsung Electronics Co., Ltd, a global leader in digital media and digital convergence technologies, announced today the GALAXY S III has surpassed 30 million global sales in approximately five months since its debut in May. 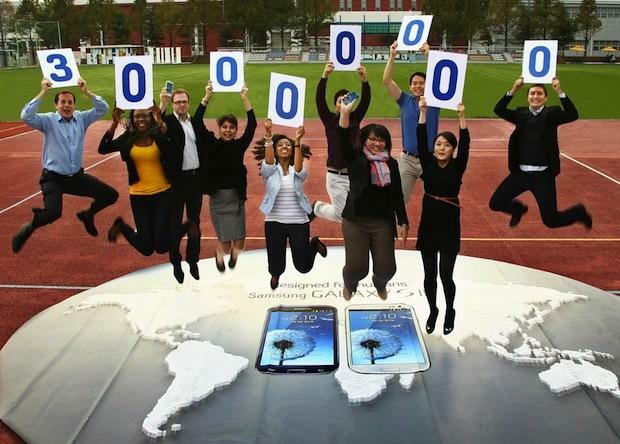 Putting this number into perspective, during a similar selling period (150 days), the acclaimed GALAXY S II, launched in 2011, globally sold 10 million devices. Now upgradable to Android™ 4.1 (Jelly Bean)?, the nature-inspired GALAXY S III is a revolutionary smartphone packed with intelligent features that make everyday life easier. Its expansive 4.8-inch HD Super AMOLED display lets users view multimedia and web content in brilliant color and clarity; and its camera understands human gestures to make using the phone incredibly natural and intuitive. A powerful hardware ensures blazing-fast performance and seamless multi-tasking. Committed to providing the best mobile experience for its customers, Samsung continues to work to enrich the GALAXY S III experience. It now allows users to explore their personal style through an expanded collection of new colors that take their inspiration from nature: Amber Brown, Garnet Red, Sapphire Black and Titanium Grey. Samsung also offers continuous software upgrades for the device, enhancing user experiences and allowing a life extraordinary.
? Availability and timing of the Jelly Bean upgrade will vary depending on the country and mobile carrier. ?? All functionality, features, specifications and other product information provided in this document including, but not limited to, the benefits, design, pricing, components, performance, availability, and capabilities of the product are subject to change without notice or obligation. ??? Android, Google, Android Beam, Google Search, Google Maps, Gmail, Google Latitude, Google Play Store, Google Play Books, Google Play Movies, Google Plus, YouTube, Google Talk, Google Places, Google Navigation, Google Downloads are trademarks of Google Inc. I will be joining the ranks of SGSIII owners soon. Relay 4G was too mid-range and the Nexus 4 & One S both don’t have removable storage. Note II is too pricey. I think we’ll get 4.2, but not until late 2013. Just upgraded from a my touch 4G to a Galaxy S3…These numbers don’t surprise me :) great phone! For those of you that are interested Sams Club will have the Galaxy s3 for .96 cents on Black Friday with a upgrade or new contract.